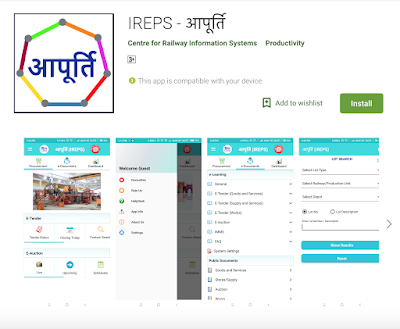 IREPS Mobile App आपूर्ति has been published on Google Play store for andriod users. 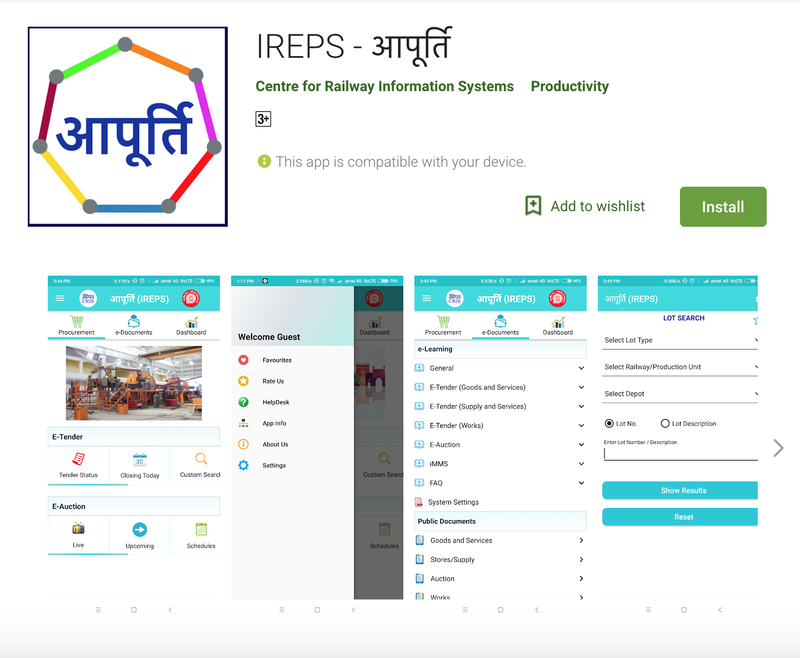 Users are requested to install आपूर्ति app for trial and provide feedback. Search 'IREPS' on Google play store for installation or Click here to locate IREPS mobile app on play store. E-tender stores/supply (i.e. old IREPS) shall not be available from, 11-Aug-2018 to 19-Aug-2018. For any enquiry in this issue, Please contact IREPS helpdesk. Balance Sale Value payment against the scrap lots purchased through e-auction can now be done in more than one installments as per sale conditions. Steps for making payments in more than one installment can be downloaded by e-auction users from their home page after login. Information on e-aucton schedules fixed but auction catalogues not published are also made visible to e-auction bidders with/without login with catalogue status as "unpublished" under Auction Schedules. To participate in the e-tenders published by different Zonal Railways, Production Units, Railway Board, CORE, DMRC, KRCL, MRVCL etc. vendors need to be registered on IREPS. There is no Registration Fee for vendors to register with IREPS. Bidders need to be registered with IREPS application to participate in e-auctions conducting by different depots of Indian Railways. You need to pay the one-time registration fee of Rs. 10,000/- through online payment methods available on IREPS. Here you can see the videos of the vendor, contractor and bidder registration on IREPS. New Vendor Registration Process for Stores (Good and Services) Tenders: You have to register your firm as a vendor to participate in the Goods and Services tenders published by different railway zones/divisions.